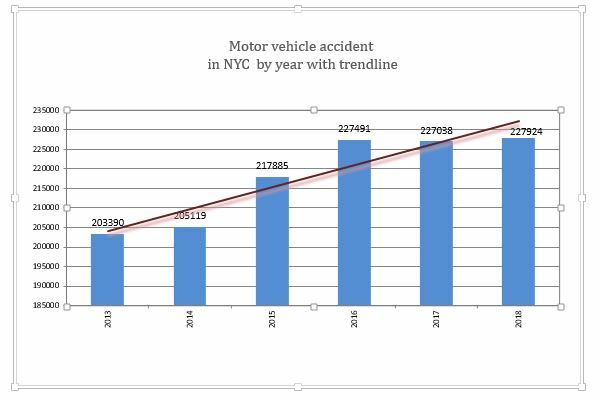 A major concern in New York City is the increase of motorist injuries and deaths over the last 3 years. 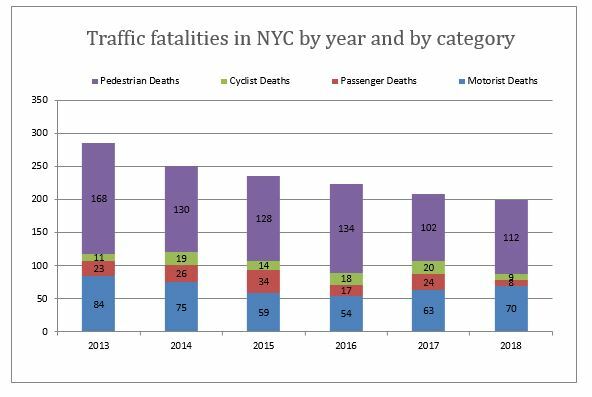 While Vision Zero has been focusing mainly on pedestrians and cyclists safety, the number of motorist injuries has been increasing by 46% since 2013 to reach 26,843 in 2018. Motorists deaths which had been gradually declining from 84 in 2013 to 54 in 2016 have been climbing again to 63 in 2017 and 70 in 2018. Are motorists more susceptible to be distracted and to have an accident when they are alone in the car than when there are one or more passengers? Does a motorist behave better on the road when he or she is not alone in the car? Despite having slightly increased over the last 3 years passenger injuries are still below the 2013 and 2014 numbers. 18,687 passengers suffered personal injury in a car accident in 2018 compared to respectively 18,151, 17, 738, 16,868, 19, 172 and 20,442 in 2017, 2016, 2015, 2014, and 2013. Passenger fatalities were at their lowest since Vision Zero started. 8 passengers died in a crash in 2018 compared to 24 the year before and 23 in 2013. It is the first time that the annual number of passenger deaths is below 10. 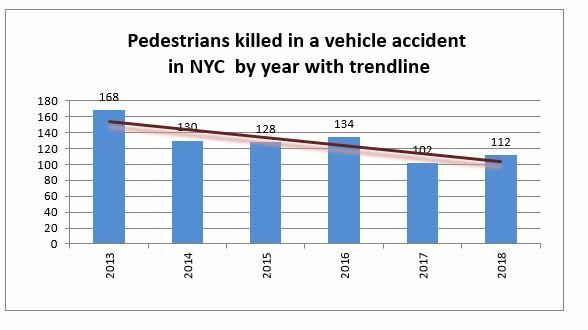 Pedestrian deaths reached a record low in 2017 but went back up slightly in 2018 from 102 to 112. Up until August the monthly number of deaths never went above 10 but after that, 15 pedestrians were killed in September and then 14 in November and 16 in December. The fall and winter months are the worst for pedestrians in New York because the sun goes down early and it is more difficult for motorists to see them. Under the Vision Zero umbrella, the yearly Dusk and Darkness campaign focus on reminding motorists and pedestrians to be particularly careful during this type of situation. It is interesting to notice that this year instead of focusing only on drivers and pedestrians, the campaign also include a special garbage truck safety campaign. As a result the police were more focused on cracking down on unsafe garbage trucks rather than keeping pedestrians safe after dark. Maybe the crack down on garbage trucks should have occurred during the summer. 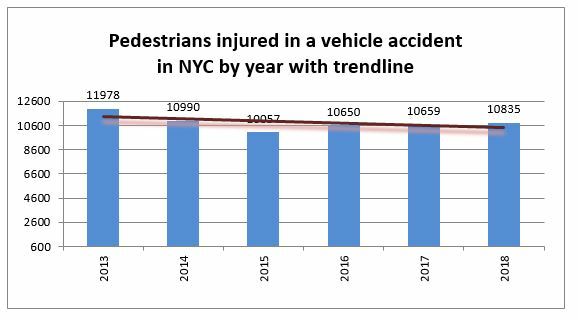 After declining from 2013 to 2015, pedestrian injuries started to rise again over the last 3 years. They haven’t reached the level of 2014 or 2013 again though and the trend is still slightly declining. For the third consecutive year, bicycle accidents in New York City are declining. 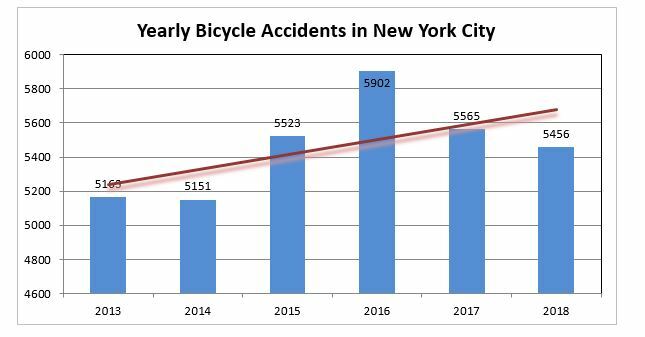 There were 5,456 bicycle accidents in 2018 in New York City compared to 5,565 in 2017, 5,902 in 2016 and 5,523 in 2015. 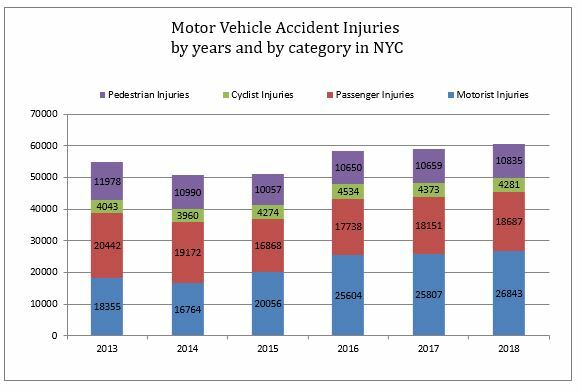 There are still more bike accidents these days than in 2014 or 2013 but there are also many more New Yorkers using their bike to commute in the city. 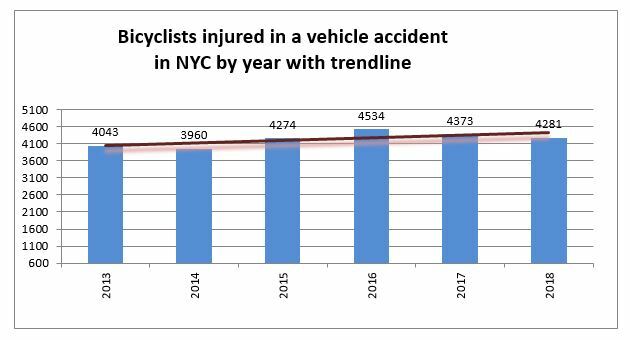 Therefore despite the bicycle accident trendline over the last 6 years still being on the rise, the more recent decline is a good indicator that all the Vision Zero initiatives to protect cyclists are starting to have some positive effect. 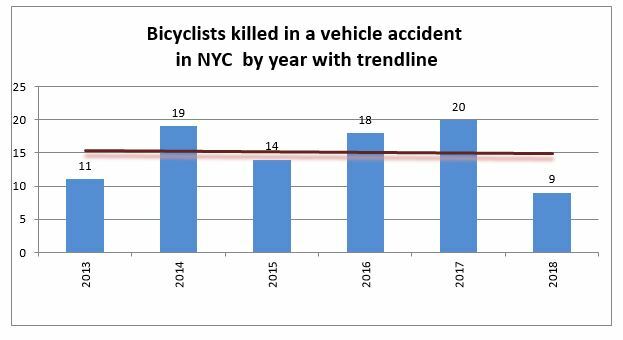 The annual number of cyclists killed in NYC accidents is at its lowest since Vision Zero started, another indication that all the efforts put together by the city to protect cyclists are starting to work. 9 people were killed in bicycle accidents last year compared to respectively 20, 18, 14, 19, and 11 in 2017, 2016, 2015, 2014 and 2013. The bicycle accident fatalities trend is now flat over the last 6 years. Bicycle accidents injuries are also showing signs of improvement but the trend is still up and the yearly number of injuries related to bicycle accidents in the city is still above 4,000. 2,546 motorcycle accidents were reported in 2018 compared to 2,526 in 2017 and 2,581 in 2016. 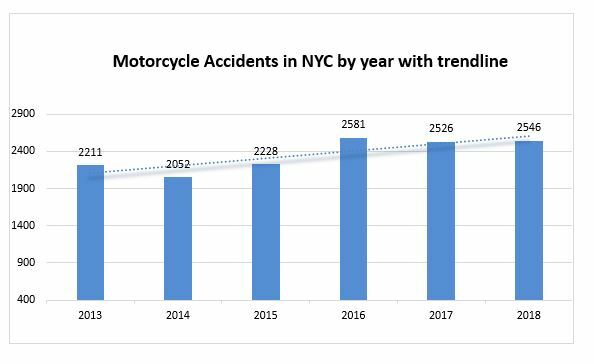 Motorcycle accidents are on the rise in New York City. Over the last 3 years they never went below 2,500. 7,138 bus accidents were reported to the NYPD in 2018. 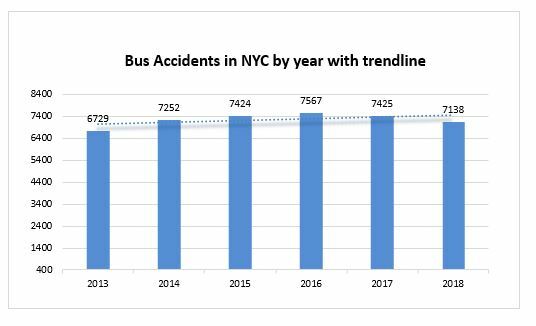 Since 2013 bus accidents have been slightly on the rise in New York City but this number is the lowest reported over the last 5 years. The only time it was lower than this was in 2013 when 6,729 bus accidents were recorded. It was also the only time over the recent years that it was below 7,000. 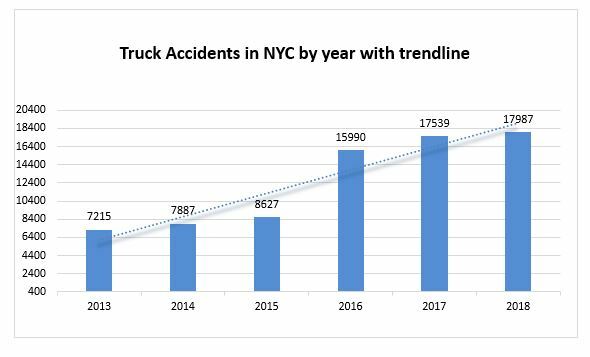 Truck accidents almost reached 18,000 last year in New York City. Over the last 3 years truck accidents have reached levels that are more than the double of the 3 previous years. This situation is preoccupying as they usually cause a lot of damages and can cause severe injuries or deaths to other road users due to their size. Trucks are supposed to use specific roads in the city but much too often they do not respect the law and create accidents in areas where they shouldn’t have been.